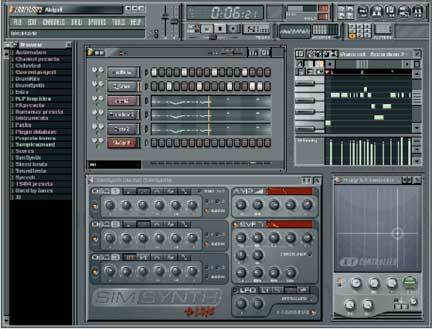 This is what the Fruity Loops looks like. This image is from www.modernbeats.com. I remember when I was growing up as a child I used to listen to rap music. The only reason I liked it was because of the beats and the rhyme. I always thought that it was beautiful because of how every last word of the lines sounds the same. I decided that I wanted to make the same kind of music. I can remember that it didn’t take that long to figure out how to make words rhyme because I was really interested in it. Because I was passionate about it, it wasn’t really hard. Also it seems easier to make rhyme in Creole and French than in English because in Creole and French you can see a word and know how it sounds, but in English it’s different. Then I wanted to make my own music, but I don’t play any instruments. One of my friends helped me download a computer program which is a program called “Fruity Loops” that gives you the ability to make beats. It took me at least a week to know how to use it. To be able to use it, I read the directions that were given, and I figured out how to use the buttons on the computer screen. It was difficult but I learned it. To make music I also needed equipment. All I had was a tape recorder and the computer program. To make the music, I played the music from my computer and I recorded the computer music and my singing on the tape recorder in my room. I sang while the beat was playing on the computer. When one of my teachers heard my music, he told me about an electronic music course at Blair. The music technology is a class that helps students learn the techniques of sound production and manipulation and uses them to create their own compositions. They use specialized electronic equipment and computer software to modify and record sounds. That sounds like a course that might help me improve my music. I am thinking about taking it next year because I am very interested in it. If you want to hear what Andre’s music sounds like, click the play button in the box above on the right.